1799 Vancouver View of Nootka Sound, Cape Mendocino, Columbia River, etc. Some of the earliest nautical views of the Pacific Northwest ever published. Vues de Diverses Parties de la Cote Nord-Ouest d'Amerique. 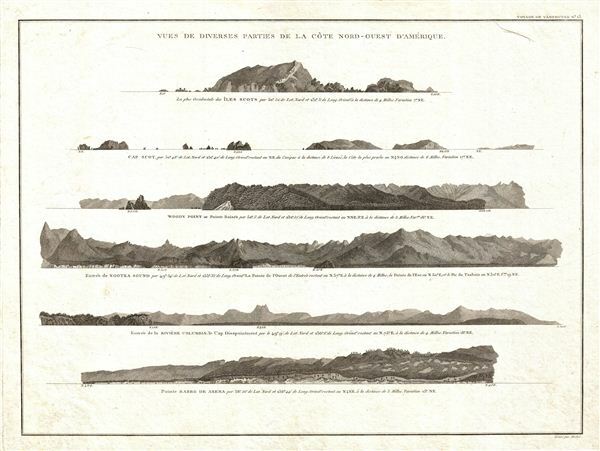 A fine example of George Vancouver's 1799 view sheet depicting various coastal profile views of the Pacific Northwest. This sheet features six beautifully rendered views detailing, from top: the Scott Islands (British Columbia, Canada), Cape Scott (British Columbia, Canada), Woody Point, Nootka Sound (Vancouver, Canada), the Columbia River and Cape Disappointment (Washington State, United States), and Pointe Barro de Arena (Mendocino, California). Vancouver and his officers drew these views while traveling northwards to begin their epic 1791-1794 explorations of the Pacific Northwest. This view sheet features some of the earliest nautical shore profiles of the Pacific Northwest ever published. This particular example of Vancouver's view sheet was issued as plate no. 15 in the highly desirable 1799 French edition of Vancouver's Atlas. The rare and coveted French edition of Vancouver's Atlas is more beautifully produced with better engraving, higher quality paper, and more detail then the 1798 english edition. He [Vancouver] put the northwest coast on the map...He drew up a map of the north-west coast that was accurate to the 'nth degree,' to the point it was still being used into the modern day as a navigational aid. That's unusual for a map from that early a time. Today Vancouver is memorialized by Vancouver Island, which he discovered, the Hudson Bay Company's Fort Vancouver, the city of Vancouver, Vancouver Peninsula Australia, Mount Vancouver, the 8th highest mountain in Canada, Vancouver Bay in Jervis Inlet, and the Vancouver Maritime Museum. For his 250th birthday, the Canada Post issued a special postage stamp in his honor. Vancouver, G., Voyage de decouvertes a l'ocean Pacifique du Nord, et autour du monde : dans lequel la cote nord-ouest de l'Amerique a ete soigneusement reconnue et exactement relevee : ordonne par le roi d'Angleterre, principalement dans la vue de constater s'il existe, a travers le continent de l'Amerique, un passage pour les vaisseaux, de l'ocean Pacifique du Nord a l'ocean Atlantique septentrional : et execute en 1790, 1791, 1792, 1793, 1794 et 1795, (Paris : De l'Imprimerie de la Republique) 1799. Very good near flawless condition. Platemark visible. Blank on verso. Rumsey 3354.006 (English edition). Streeter, T. W., The celebrated collection of Americana formed by the late Thomas Winthrop Streeter, 3498. Sabin, J., A dictionary of books relating to America: from its discovery to the present time, 98443. Cowan, R. E., A bibliography of the history of California, 1510 -1930, 1933. Wagner, H. R., The Cartography of the Northwest Coast of America To the Year 1800, 853-860.